Henstrom Happenings: 6 weeks? Where does the time go? 6 weeks? Where does the time go? 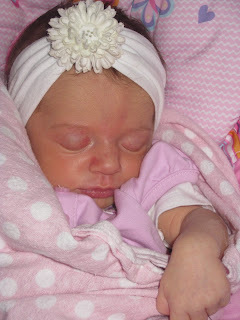 I can not believe that it has been 6 weeks since Lily joined us here on earth. Thus far she has been a really good baby. Her novelty has not worn off for her siblings they still want to love her all the time. I thought her umbilical cord was never going to fall off, it took 3 1/2 weeks! I did not know that such a little girl could have such stinky gas! Jackson seems to have a very special bond with Lily, she usually calms down when he talks to her. Since Lily came Jackson has been having less tantrums. Yeah! We took our first road trip with 4 kiddos. It was my grandmas 80th B-day so my Mom planned a surprise party for her. Off to Salmon, Idaho we went! We stopped in Boise on the way and stayed with my sister before we all made the trek to Salmon. The kids got to meet their new Cousin Gage for the first time. Gage is 2 months older than Lily. You would think it was more like 9 months older from the size of him. I affectionately call him Gigantor. He is adorable! Here are some pictures from our whirlwind trip. It was a lot of work but I am glad that we went. The kids had a great time with their cousins! It was not long enough, it seemed like I was always nursing so I did not get to visit a whole lot but it was worth it to see everyone! I can't wait to see that little girl of yours!! She is adorable in her pictures. We miss you all so much. Have I become that Mom?